Video footage from behind the City End goal in Nowlan Park will be key to deciding whether Tipperary will contest Lar Corbett’s red card. Both Corbett and JJ Delaney were sent off in the second-half of Sunday’s Division 1 League final, an incident which also involved Kilkenny goalkeeper Eoin Murphy who was neither yellow nor red carded. The 2010 hurler of the year suffered broken ribs and was taken to hospital on Sunday evening. TG4’s live footage of the game showed Delaney striking Corbett’s helmet with his hand as the pair grappled on the ground. Based on what was broadcast of the incident, it remains unclear why Corbett was dismissed. However, referee Barry Kelly made the call to send both players to the line after consulting with his umpires. Were Tipperary to query the red card, they would have to prove the 2010 hurler of the year didn’t merit a red card against the evidence provided to Kelly by his assistants. However, it remains to be seen whether the camera actually picked up the full extent of what happened between the pair. Like Delaney, Corbett is facing a one-match ban, which would rule him out of the June 9 Munster semi-final against Limerick in the Gaelic Grounds. The seriousness of his injury, once the extent of it is learned, may yet make him unavailable for the game anyway and could compel Tipperary not to seek a hearing. Speaking on Tipp FM yesterday evening, chairman Sean Nugent said it was likely the injury would make him unavailable for the date with Limerick. Nugent also said Corbett was unsure of when the injury took place. As the Irish Examiner revealed yesterday, the 32-year-old had been brought there as a precaution following the game to ensure he didn’t suffer kidney damage. However, he is scheduled to speak to the press in Croke Park today at the announcement of Liberty Insurance as the new associate sponsors of the All-Ireland senior hurling championship, replacing Guinness. Kilkenny’s Jackie Tyrrell will also be attending the media launch. Meanwhile, Delaney’s fellow defender Paul Murphy anticipates competition will be fierce to replace the 2003 hurler of the year for the Leinster SHC quarter-final against Offaly in Tullamore’s O’Connor Park on June 9. Tipperary’s Brendan Maher said he and his team-mates will “be confident that they’re good enough” to overcome the loss of Corbett against Limerick. “Lar would be a huge loss, but you’ve seen the way that Eamon (O’Shea, manager) is picking the team,” said Maher. “He’s picking the 15 form players for the start and there have been five or six changes for every game. Maher acknowledged the intensity of Sunday’s encounter: “That’s the game we play and the game we were expecting. There was a stage there when there were five or six hooks or blocks in-a-row. 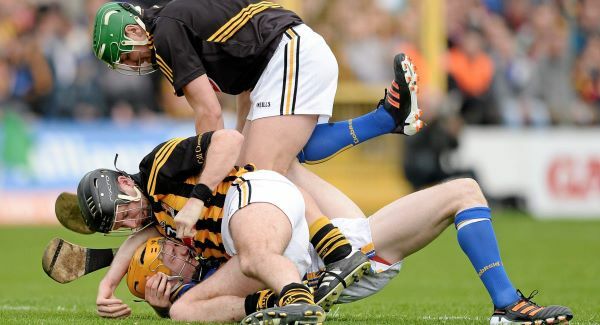 That’s what you expect when you play Kilkenny — a physical battle. You take positives from things like that. It’s just sheer disappointment now with the loss. “In our last two outings we weren’t really tested the way we wanted to be, but that was a ferocious battle. We were happy with the way we battled and obviously there were negatives there as well. “We didn’t create enough goal threat and we didn’t push on when we got to within two points or a point of them to get over the line.